25 years later, we still haven’t made any money! One of our major target markets is the CSI sector… Many people around South Africa has Day Zero every day. Yes, we are [interested in commercialising the Hippo Roller]. The Hippo Roller was conceptualised in 1991 by South Africans Pettie Petzer and Johan Jonker. They grew up on farms and saw people carrying heavy buckets of water on their heads for kilometres every day. Jonker noticed that workers on his father’s farm collected empty 20-litre plastic containers to use to fetch water. These containers are typically of poor quality and not very durable. He thought there had to be a better way. As co-inventor Petzer describes it, the original idea was based on a wheelbarrow including a moulded tank for a low centre of gravity. In trying to get their concept going, one of the first problems they encountered was the price of the wheel itself. So, they put the water inside the “wheel”! The Money Show’s Bruce Whitfield interviewed Hippo Water Roller Project CEO Grant Gibbs for his weekly “ShapeShifter” feature. We’ve exported to 45 countries. We’re not in retail, although Cape Town is changing that picture. The Hippo Roller is such a simple technology; that’s the beauty of it! 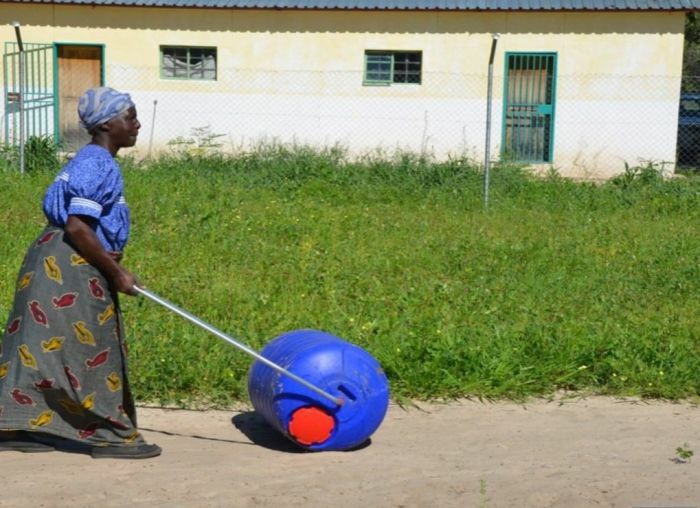 Hippo Rollers help people irrigate more efficiently.